November 8, 2011 Congratulations Due Michael Mercier! July 12, 2011 Summer Barter Expo Scheduled In Orange County, CA. Ron Whitney, Executive Director of the International Reciprocal Trade Association (IRTA), has announced that the association will have representation at the London sponsored seminar on Capacity Trade and Credit, scheduled on December 8. Follow-up details on the seminar will be reported. Imagine having an opportunity to get back more than 24 times (2400%) your initial investment in just two years, and passing on it. Then a few years later, as your initial investment sours, you end up selling it for 1/15th of your investment � a huge loss. Rupert Murdoch�s News Corp. bought Myspace in 2005 for $580 million. Just two years later, Murdoch had an offer to sell Myspace to Yahoo for $12 billion (that�s billion!). He did not sell. Then in 2011, in our ever fast-changing world, he sold Myspace to an investment group for $35 million. The European Club for Countertrade & Offset (ECCO) will be hosting a symposium on December 14 & 15 in Brussels, Belgium. Members of Congress, Senators and Congressmen (along with staff members), are not subjected to insider trading rules like the rest of America�s citizens. Their insider trading activities were recently exposed in a �60 Minutes� television expos� on Sunday, November 13. In short, a legal loophole excludes members of Congress from insider trading rules, even though they are privy to nonpublic information. Information which they can use to buy and sell stock, land, etc., for their own financial gain. A new book, Throw Them All Out, by Peter Schweizer covers the subject in much greater detail. Last week in this space we noted that Michael Mercier had held the position of �President� in both industry associations ... the International Reciprocal Trade Association (IRTA) and the National Association of Trade Exchanges (NATE). There is another distinguished industry veteran who also served as president of both IRTA and NATE � Stephen Webster. 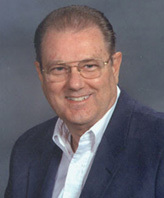 Webster played a key role in the creation of the �Certified Trade Broker� program, as well as being a member of the IRTA Barter Hall of Fame. The city of London has sent out invitations to various business entities regarding their sponsored seminar on Capacity Trade and Credit, scheduled on December 8 this year. Follow-up details on the seminar will be reported. According to Don Mardak, founder and CEO of IMS Barter, this year�s Milwaukee-area Barter Expo held at the Milwaukee County Sports Complex was �the biggest and best show we have ever had.� The huge venue, which houses four indoor soccer fields, provided ample space for 250 exhibitors. In excess of one-thousand IMS Barter members attended the record-setting event which included an auction of six cars, 12 big-screen TVs, and a new motorized fishing boat with trailer. FOX television covered the Expo, and it aired across their national network. Reportedly, nearly $2 million of products were moved at the event. The International Franchise Association�s recent survey shows that nearly 85% of 150 U.S. franchisers � including chains with fewer than 50 locations nationwide � said they planned to start or accelerate international operations within the next few years. Why? Because outside the U.S. financing is easier and there�s a hunger for American offerings. MatchingDonors.com is a 501c3 nonprofit organization and the world�s largest online living donor company. To register as a living donor go to their web site. Residential land values nationwide in the U.S. have fallen nearly 70% since peaking in the second quarter of 2006, according to a report by the Lincoln Institute of Land Policy, a Cambridge (MA) think tank. Meanwhile the value of U.S. cropland (excluding Alaska and Hawaii) rose close to 20% between 2007 and 2011, according to the U.S. Department of Agriculture. The demand for farmland is being fueled by rising prices for everything from corn to cotton. And we�re seeing situations where farmers are buying back, at much lower prices, the land they had previously sold to land developers. Reaching your customers with effective advertising is important in these competitive times. And effectiveness will often depend on the time of day and your target audience. Research has found radio is king in the early-morning commuting hours, while television shines after 5pm. By comparison, the Internet is popular throughout the day with a range of age groups, while newspapers are most popular with the baby-boomer generation. Experian, the financial data and credit scoring giant, reports that companies of all sizes are delaying the paying of their bills, by as much as 28.3% longer in the third quarter. Midwest businesses are the tardiest payers averaging 10.6 days overdue, while the Northwest was the least tardy with 3.9 days on average. The Kauffman Foundation, an entrepreneurial think tank, reports that 96% of top economic-bloggers polled have a gloomy outlook on the American economy. � Pablo Picasso, Spanish artist. � Henry Miller, American novelist & painter. � George Eliot, British writer. The Federal Reserve Bank of New York reports that total U.S. household debt fell by $1.1 trillion or 8.6%, from mid-2008 through the first half of 2011. The national belt-tightening comes as the U.S. economy struggles to fend off a double-dip recession. U.S. manufacturers have increased their productivity dramatically over several decades, according to the National Federation of Independent Businesses. In fact, it now takes less than a fifth (1/5) as many workers to produce the same output as it did in 1950. That�s why the manufacturing sector cannot be expected to solve the nation�s unemployment problem. The world is getting wealthier, but Americans are not. Total global wealth grew 14% to $231 trillion from January 2010 through June 2011, according to the Global Wealth Report. However, in the U.S. total net worth remains below 2006 levels. IMS (OCTBB:ITNM), a business-to-business barter service, saw it�s stock close on Friday, October 21, at a two-year-high price of $1.95. The Milwaukee Business Journal ranked IMS 5th on Wisconsin�s top-25 best-performing stocks for 2011. Thomas Greco Jr., well-known in the commercial barter industry due to his numerous speaking engagements at IRTA and elsewhere, sees encouragement with today�s unrest among American citizens as well as those worldwide. His speaking schedule is ambitious as he continues to tout the advantages of private currencies. To follow his comments on his web site click here. Greco will next appear at the �International Conference On Sustainability, Transition and Culture Changes� near Traverse City (MI), November 10-14. For more info click here. Here�s an update on a recent National Federation of Independent Business (NFIB) survey, based on the responses of 729 small-business owners. Nine out of ten (90%) said the economy is on the wrong track, although, in contrast, 68% said their businesses are headed in the right direction. Major challenges foreseen by respondents included: economic uncertainty, America�s debt and deficit, over-regulation and loss of revenue. Only nine percent (9%) expect improvement in the coming six months, and 38% expect deterioration. What could reinforce this �change is constant� statement more so than the recent announcement by Gap, the largest U.S. clothing chain? Gap plans to close 189 locations (21% of its U.S. stores by 2013) in the U.S. and at the same time triple the number of Gap stores in China, from 15 to 45, by the end of 2012. According to research by the Congressional Budget Office, Americans reduce spending by $20 to $70 a year for every $1,000 decline in the value of their home. This �wealth effect� is significantly larger for changes in home equity than in the value of other investments, such as stocks, because people regard changes in housing prices as more likely to endure. Newspaper advertisers in several Canadian cities can trade their products and services for ad space in various daily newspapers. The newspapers will then turn around and auction off the acquired goods and services. For more information on this way of doing business click here. Want to project a stronger professional image? Rita Rocker, founder of Transformer Academy in Boystown (NE), says it will revolve around your communication skills, because those skills affect the way others perceive you. Effective communication can help ensure that others take you seriously, trusting in your ability to do business with them. According to Glen Stansberry, speaker on business growth, the nine out of ten businesses that allow fear to cripple them will fail. Innovation, he contends, is what got you started in the first place and you should continue to invest in it. Don�t let the fear of profitability, success, or anything else convince you that maintaining the status quo is more important than creating. Ever notice how many (most) companies are �too busy� to focus on marketing, especially when they have a lot of business? Sometimes they even cut the �marketing expense� all together. And then when they finally get around to doing some type of marketing, it usually means they have little or no business. This keeps their business flat and perpetuates a feast or famine cycle. What strategy should be followed? Implement a system that builds trustful relationships over a long period of time. Remember, we can�t sell anything to anyone, we just need to be there when people are ready to buy. The use of Craigslist�s for possible barter deals is reportedly soaring, as it�s the latest trend due to the prolonged economic downturn. BarterQuest says it has seen a 150-percent increase in users since the recession. The NATE (National Association of Trade Exchanges) board of directors is looking for a location to stage next year�s annual convention. To stay abreast of what the association for independent trade exchanges is doing click here. Mort Zuckerman, Editor of U.S. News & World Report, says last month was the first time in 66-years the U.S. had no jobs created. That situation, along with a real unemployment of 19%, is unprecedented and cannot be allowed to continue, he contends. According to Zuckerman the way out of the malaise is for the U.S. educational system to undergo a massive, concentrated effort to educate our young in math and science. Trade exchanges everywhere are gearing up for the coming holiday season with their holiday barter expo�s. Experienced traders know the value of attending these events to view hundreds of products and services on display for purchase on a full trade basis. Shoppers are expected to make fewer trips to stores and when they do show up, to head straight for bargains they have researched in advance. Given such a forecast, trade exchange owners expect to see their savvy members taking advantage of the numerous barter offers within their exchanges this holiday shopping season. They report that businesses continue to keep inventory lean based on weak consumer sentiment, thus containing shipment volume and heightening the focus on cost controls to boost profits. Last week BarterNews reported on how hotelier Laurence Geller had recently, through a string of clever deals, rescued Strategic Hotels & Resorts and its 17 trophy hotels from the brink of financial ruin. What we didn�t include in the article was how the 63-year-old Englishman acquired his empire through barter � by teaming with Goldman Sachs Group and its partner famed real-estate investor Bill Sanders� Security Capital, to form Strategic Hotel Capital back in 1996. It occurred when Goldman and Security Capital each contributed $200 million, while the wily Geller chipped in $4 million plus his hotel expertise for a third of the action! One of the International Reciprocal Trade Association�s newest members will be making a presentation at IRTA�s 32nd annual convention this week in Riviera Maya, Mexico. Dr. Paul Bocheck, BarterQuest�s co-founder and developer of its patented technology, will talk about his matching engine algorithms to the industry�s attendees. A survey of 226 registered investment advisors commissioned by Scottrade has some strong advice to Generation Y (ages 18-26) and Generation X (ages 31-45). Their advice: start saving for retirement now, as according to 77% of the advisors, you�ll need at least $2 million when you stop working, if you are to enjoy financial freedom in your golden years. Boom-and-bust hotelier Laurence Geller has recently, through a string of clever deals, rescued Strategic Hotels & Resorts and its 17 trophy hotels from the brink of financial ruin. The 63-year-old Englishman built his career clashing with hotel giants such as Marriott International over costs for managing his hotels and with unions. The company�s stock hit a low of 61-cents in 2009, and recently traded at $5.12. Strategic�s resurgence under Geller was due to his creative thinking, unusual restructuring, and refinancing of their debts. As well, he recruited deep-pocketed partners to recapitalize some of his debt-saddled hotels. Another deft move was to reduce his debt by buying hotels with company stock rather than selling assets. For example, he used stock to acquire Four Seasons hotels in Jackson Hole (WY) and Palo Alto (CA), as well as bartering with stock to buy out Strategic�s partner in the InterContinental Chicago. The market value of the company�s stock is roughly $950 million after hitting a low of $54 million in 2009. The ITEX Board of Director�s approved a quarterly cash dividend of 4-cents per share, payable on September 20, 2011, to stockholders of record at the close of business on September 9, 2011. The yield is 4% based on a $4-stock price. This is the company�s 6th consecutive quarterly dividend, which has returned $790,000 to stockholders since June 2010. Looking for more motivation? Try focusing more specifically on your goals and targets. Targets create a sense of purpose and add meaning to even the most repetitive tasks. Without a goal to shoot for, work is just work. TradePal, a people-centric marketplace that helps users list, discover, share and trade unique items with trusted peers, has been announced. For more information on this social P2P marketplace click here. More success in social interaction and sales comes about by closely observing people. Whatever they talk about the most is what�s important to them, so listen closely. Frame what the other person is by identifying their fears, successes and choices. Some people may surprise you, but that means they�ve just given you more information to incorporate into your understanding of future encounters with them. Life isn�t about waiting for the storm to pass. It�s about learning to dance in the rain. This year�s convention slated for September promises to have its emotional moments as Wallach, the former IRTA president, recently passed and will be fondly remembered by many in attendance. For more information on IRTA and its upcoming convention click here. Social Media For The Small Business Owner? Are you using social media in the promotion of your small business? If so, you are in the minority. Only 12% of small businesses say social media is a �must� for promoting their business, according to a survey from Hiscox. The survey also revealed that 47% of small businesses don�t use social media at all. Respondents said they don�t have the education or the time needed to invest in social media. A guide from the U.S. Small Business Administration lists issues to consider before buying a franchise, as well as scams potential buyers should watch out for. The site includes resources for franchise sellers, too, such as links about disclosure requirements. U.S. credit-card debt shrank 5% in the second quarter from a year ago, approaching a 10-year low. Consumers have been tightening their belts and working second jobs to pay off their credit-card bills. And more consumers are setting up a savings account once they�ve worked their way through their plastic debt. The goal for most is having at least three months of cash to cover living expenses and preventing emergencies from sending them back into the red. The non-profit organization Count Me In helps mentor and grow female-owned businesses. They are behind the movement, �Make Mine a Million $ Business,� with an ultimate goal to get 1,000 women business owners to the million dollar mark. The organization is coming to Philadelphia, September 25 & 26. A real estate and personal property barter session is scheduled for October in Oklahoma City. It�s where merchandise, services, real estate, boats, cars, and excess inventory are traded via a flat visual exchange auction board. Such workers provide staffing flexibility in addition to avoiding costly full-package employee benefits, such as retirement and health insurance, which can cost between 20% and 28% (or more) on top of a base salary. Malaysia�s two largest airlines are collaborating in a bid to reduce competition and cut costs in one of Asia�s key economies. The two competitors have also agreed to barter shares of their respective companies further cementing the companies� ties. The National Association of Trade Exchanges (NATE) has announced that the NATE intercity currency, called the Banc, has a new web site (www.NateBanc.com). It will provide additional information, as well as a Banc membership agreement. NATE members can also contact Lauren@Natebarter.com. The myth that small business can�t get credit is incorrect, according to the National Federation of Independent Business (NFIB). The organization reports that two-thirds of their members that requested loans were approved. What members of NFIB are concerned about is the depressed economic climate and lack of consumer purchasing power. The National Association of Trade Exchanges (NATE) has announced that its intercity currency, the Banc, has a new web site which will provide additional information, as well as a Banc membership agreement. A recent McKinsey report says the U.S. needs to create 21 million new jobs by 2020, to regain full employment. To accomplish that feat the U.S. labor market would have to grow at the same rate as it did in the second half of the 1970�s. Septima Clark, American Educator and Civil Rights Activist. Laurence J. Peter, Canadian-Born Educator. 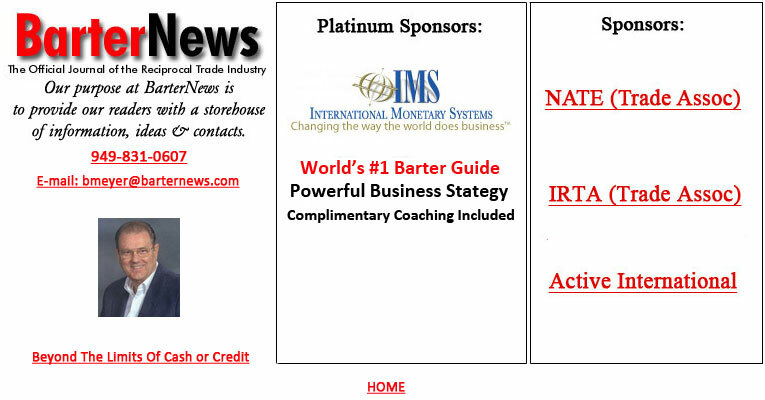 The International Reciprocal Trade Association�s 32nd annual convention at the Aventura Spa Resort in Mexico�s Riviera Maya has received the support of Florida Barter as the Silver Sponsor of this year�s event. The convention is scheduled for September 19-21. For more information on the convention and IRTA click here. The huge sports memorabilia company, Upper Deck, recently downsized from their large office building in Carlsbad (CA) that liquidated 600 office chairs, desks, tables and more, in a 3-day sales blowout. The San Diego ITEX office had numerous members making the trip to nearby Carlsbad, scoring some exceptional office furniture buys on trade. Gallup has been tracking Americans� confidence in banks since 1979, and today�s lack of confidence in banks is at an all-time high. Even now, three years since the financial crisis, we see the banking community prestige continuing to slip. Almost 40% of Americans have �no confidence� in banks. Nearly 1-in-4 workers in the U.S. are now working at home at least part of the time, U.S. Bureau of Labor Statistics report. Most of them (64.2%) are self-employed, but 23.1% of full time (9-to-5 day) workers also take work home. And people with college degrees (36.1%) are working, at least part-time, from home as well. Earn more than $75,000? Is your credit score more than 720 (in the top third on the 850-point scale)? Than you have probably noticed national credit-card companies are dangling the goodies at you, even though you probably have plenty of plastic already. In the first quarter of 2011 credit-card companies mailed 1.4 billion offers for new credit cards � that�s a jump of 69%, from 826 million a year earlier! Gallup pollsters report that most Americans have a great deal of confidence in small business � more so than the churches, public schools, the police or the Supreme Court. Small business ranks second only to the military. Gallup has been conducting annual confidence surveys since 1993. In the latest poll 64% of respondents said they have a great deal of confidence in small business, compared with 19% who said the same about big business. U.S. Bancorp found that three-quarters of small business owners surveyed believe the U.S. economy is still in a recession and 85% of them expect it to continue next year. The most pessimistic owners were in Oregon and Arizona. Just a year in existence, Fiverr.com has become an international marketplace for people to buy and sell everyday services. With nearly 500,000 listings, almost everything can be bought in $5 increments. The focus of the site is on small professional tasks that could take a novice half-a-day to figure out, but an expert could turn it around in minutes, i.e., like solving an HTML problem. The site�s growth underscores the shift from the traditional 9-to-5 job to one in which outsourcing and freelancing are becoming more commonplace. Sellers are paid only after a buyer confirms and rates a service. How Do You Rate These Thoughts? The Census Bureau says that 51.6% of all U.S. businesses are operated primarily from a home. Most are small, with 93.1% having annual revenue of less than $250,000. Of those, 57.1% have revenues of less than $25,000 and 62.9% have no employees. A reader had a question regarding last week�s article �Astute Entrepreneurs Know That Joining Groupon Is NOT The Way To Go,� regarding Groupon�s pricing. The question was: What percentage of the normal selling price does the retailer end up with? Here�s an actual example of a company that offers a tour of San Francisco�s Chinatown. Groupon sells a tour voucher for $12 (half off the normal $24 tour price). Then Groupon takes a 50% cut � $6 from the voucher cost. Bottomline, working with Groupon will earn the retailer 25% of the normal retail price. A business can look at its customers and by ascertaining their value (to other businesses) can construct barter deals. For example, an enterprising business owner trades with airlines for travel by providing access to his client list. He also trades with marketing people for advice and sales techniques, in return for giving them �profile� (new leads) from his customer base. Would you like to use those gift cards received at Christmas to pay for utility, car, or mortgage payments? Within the next two months it will be a possibility. New software from ChargeSmart, a San Francisco-based online bill payment portal, and Plastic Jungle, one of the largest gift card exchanges in the U.S., have created a system where consumers can basically turn their gift cards into cash (up to 92% of the full value of the card) to pay household bills. It�s estimated that there�s an aggregate of about $30 billion in balances on unused gift cards. The U.S. is actually in worse financial shape than Greece and other debt-ridden European countries, says Bill Gross. Gross is the CEO of Pimco, the world�s largest bond-trading organization, and makes that bold statement in reference to all the money now owed to cover future U.S. liabilities like Social Security, Medicare, Medicaid, pensions of government workers, the military, etc. Add it all together and Gross says the total is nearly $100 trillion. According to the Bureau of Labor Statistics, entrepreneurs started 505,473 businesses in the last 12 months. It was the weakest growth since the tracking of numbers started in the 1990s. The weak economy and uncertainty is creating the wariness among entrepreneurs. Recent census data show that the number of Americans ages 25 to 34 living with their parents has jumped to about 5.5 million -- a figure that accounts for roughly 13% of that age range. Compounding this full-house phenomenon, the grandparent generation is �doubling up� too, as the sociological literature says. A recent Pew Center report, �The Return of the Multi-Generational Family Household,� chronicles the trend: during the first year of the Great Recession, 2.6 million more Americans found themselves living with relatives. All told, 16% of the population was living in multi-generational households in the 1950s. The International Reciprocal Trade Association has announced that the 4.5-star Aventura Spa Palace Resort in Riviera Maya will be the site for their 32nd national convention scheduled for September 19-21, 2011. It was eight years ago this month that Steve White took over as the new CEO of the ITEX organization in Sacramento (CA). He immediately began implementing changes at the largest trade exchange in the U.S. A focus on greater efficiency was of foremost importance. After one year the headquarters relocated to Bellevue (WA). Shareholders in the publicly-traded company have done very well under White�s leadership, seeing 100% per year gains, on average, since 2003. In the U.S., homeowners who haven�t made a payment for as much as 5 years continue to live in their homes. Nationwide, it takes an average of 565 days to foreclose on borrowers in default � from their first missed payments to the final auction. The National Association of Trade Exchanges annual convention was recently concluded, with the participants returning to their home offices having gained renewed enthusiasm for the barter business. The event was held at the beautiful Phoenix Marriott Mesa Hotel & Convention Center, and was hosted by the Arizona Trade Exchange. Some thirty independently owned and operated trade exchange owners and staff met, exchanging ideas and aspirations, as well as products and services. Such annual meetings are the ideal setting for brainstorming where exchange owners can gather new ways to better their individual operation, as well as furthering the commercial barter industry. The video ABC-coverage of the event can be viewed on their web site. For more information on NATE click here. Fifty-six (56%) percent of U.S. workers have less than $25,000 saved, while 60% percent of retirees have less than $50,000 set aside. Additionally, some 45 million Americans are on food stamps. People in these situations will likely be working long after retirement age. Statistics from the Bureau of Business Analysis reports that the Golden State accounted for 13.1% of all the goods and services produced in the U.S. last year. (They have approximately 10% of the country�s population.) Texas was a distant second at 8.3%. Almost daily, the newspapers have stories relating how the gap is closing between China and the United States. Here�s a statistic that we came across recently that was quite revealing, given that China�s population is four times as large as that of America. In China there are 130 executive business jets � in the U.S. there are 15,000 executive jets. A very rare and special live charity-event for Friendly House LA (helping women since 1951) will be held by the famed Pointer Sisters on Monday June 27 at 7 PM at the world-famous Roxy. Tickets are $50, for details call 213-389-9964. The National Federation of Independent Businesses recent report foresees a tightening for small business. It suggests that small business credit will become harder to get once again. The report says we are closer to very negative levels of expectations about future credit availability, similar to levels seen at the depths of the recession. Now�s the time to contact your local trade exchange for credit extension to grow your business. Just a few days away, on June 19 (Father�s Day), there will be a $10 billion business opportunity. The average shopper will spend $100 on this day, according to BigResearch. The Revel casino development in Atlantic City (NJ) is nearing completion of a deal with the aid of barter. The 1,900-room resort with 19 restaurants received a commitment from a Chinese bank for an additional $1 billion, in exchange for using a Chinese construction company and Chinese materials. According to a survey by the National Association for the Self-Employed, small business owners say the government should minimize social security for wealthy recipients and increase the payroll-tax cap on wages in an effort to reduce the federal deficit. And nearly 60% also chose repealing the health care overhaul and cutting defense spending as a way to cut costs. A Los Angeles edition of Food-As-Currency event recently took place after similar events in Seattle and Brooklyn. For other food swaps in California as well as other parts of the country see: www.lafoodswap.com. The largest American trade exchange, with 24,000 small business members across the U.S., held their 29th annual convention in Las Vegas last week. One hundred forty brokers and corporate staff spent four days strategizing and socializing. The annual event is eagerly anticipated by many as a positive way to reconnect in today�s hectic world. The State of Utah has legalized gold and silver as an alternative currency, although shop keepers/retailers have the option of accepting it or not. The state will exempt the coins (typically considered an investment) from capital gains taxes. There are other states considering similar laws including North Carolina and Idaho. Trade exchange owners and others involved in the commercial barter industry will be gathering June 2-5 at the Phoenix Marriott Mesa Hotel for the National Association of Trade Exchanges annual convention. To register, e-mail Lauren@natebarter.com or go to www.NATEBarter.com. Small business owners won�t start spending again until they�re more certain of a payoff. Today, rather than spending to expand (as the economy improves) they are saving cash and biding their time, just in case the economy turns south again. According to job placement firm Adecco, about 60% of recent college graduates have not been able to find a full-time job in their chosen profession. Last year the unemployment rate for college graduates age 24 and younger rose to 9.4%, the highest since the labor department began keeping records in 1985. Trade exchange owners and others involved in the commercial barter industry will be gathering the weekend of June 2-5 for the National Association of Trade Exchange�s convention at the Phoenix Marriott Mesa Hotel. To register for the annual convention contact Lauren@natebarter.com or click here. Debbie Lombardi, President of Barter Business Limited, will be one of the guest emcees at the Connecticut Business Hall of Fame ceremony on May 20 in Hartford. Don Mardak, CEO of the publicly-traded International Monetary Systems (OTCBB:ITNM), reports that the IMS Board of Directors has authorized a stock repurchase plan. The company intends to buy back up to 10% of its outstanding shares from time to time at prevailing market prices. On Friday, April 29, 442,468 shares were traded. Last week�s tribute to Martin Nobler stated that he died of a heart attack and was 69. BarterNews has since been informed that the cause of his death is still undetermined, and that Nobler was age 70 at the time of his passing. If the visitor�s answer is �no� the staff will briefly give a couple minute informative rundown on what brands and products they offer. The interaction also allows tracking on how the visitor heard about of the boutique. Have twice as much capital as you think you will need. If you think it will take eight months to build the restaurant, realize that it will be twice that. Expect the unexpected, it will ultimately happen. And go slowly. Don�t try to feed 300 people on the first night. You want to be a good restaurant for 20 years, not twenty weeks. The time it takes for a venture-backed company to reach an IPO from its inception has increased steadily over the past decade, to a median 8.1 years, according to data from Dow Jones VentureSource. BarterFirst International is staging its �Second Annual Spring Business Expo� for the Central Florida business community on June 9. For information call Cynthia at 407-478-3156. Super salesman Art Kaliel of the San Diego ITEX brokerage, has arranged a piggyback agreement with the San Diego Beatles Fan Club. The day-long event is scheduled for May 21 and Kaliel envisions a huge turnout. His goal is to introduce barter to thousands of first-timers. Booth space on trade is available. For more information call Art Kaliel at 760-613-6412. Occupancy increased by 6.1 percent to 61.4 percent in March (year over year), according to hospitality research firm STR. Leading the way were luxury hotels with the highest rate of growth. The painful turn-around process for the U.S. housing market isn�t getting much better. Annualized new home sales in February was 250,000, the lowest monthly figure on record dating back to January 1963. They were down a stunning 82% from the July 2005 peak. Customer loyalty specialists Colloquy and Swift Exchange report that Americans rack up at least $48 billion (yes, billion) of reward points and frequent flyer miles every year. And, they contend, at least a third of them go unredeemed. �Marshall McLuhan, Canadian educator, philosopher & scholar quoted for Earth Day 2011. �Magic Johnson, NBA Hall-of-Fame and entrepreneur. On May 10 Microsoft�s co-founder will be making a keynote speech in Seattle for Climate Solutions, a small Seattle non-profit organization combating global warming. Gates will be speaking on a topic he�s been researching over the last several years � global warming. Gates is known and has made a name for himself by looking at global problems through a quantitative lens rather than an emotional one. To read Gates� blog on this topic click here. �Bjarne Stoustrup, Danish computer scientist. �Russell B. Long, former U.S. senator. Are you bartering with businesses that target similar demographics, but provide different products and services? Now is the time to trade customer lists, display each other�s promotional materials, and offer discounts to each other�s customers. Consider setting up an educational session that features you and the other business owner(s) as speakers � collect an attendee list and share the information. According to the National Council on Aging, one in every three (33%) seniors is economically insecure, living on an annual income of less than $22,000. Web advertising in the U.S. rose 15% to $26 billion last year and outpaced both traditional media and newspaper ad revenue for the first time, according to the Interactive Advertising Bureau. Sun Country Airlines has a unique barter offer to travelers � book a trip to London and in exchange for your business Sun Country will provide a free round trip ticket for travel anywhere it flies in the contiguous USA. Author and monetary expert Tom Greco writes an important article, �Stop Chasing the Buck and Change Your Luck.� It�s about organizing an entirely new structure of money and finance not controlled by banks � cashless trading networks. Advertising in the U.S. is expected to increase 2.5% to $155.2 billion in 2011 as marketers in the financial, retail, and automotive sectors start spending more following the recession. Global ad spending is expected to grow 4.2% to $470.8 billion. The Securities ad Exchange Commission (SEC) is considering adapting its rules to make it easier for fast-growing companies to raise money by tapping investors, through social networks, for very small amounts of shares. The issue is part of a wider review by the agency into whether to ease decades-old constraints on share issues by closely held companies. For example, a company looking to raise $100,000 could use the Internet to invite interested parties to buy as much as $100 in shares per investor. Special kudos to Ginger Gausman, BarterNews� web-master, for all of her efforts in bringing our readers the special editions of the Tuesday Report during the month of March. And �thanks� to our many readers who sent notes and expressed kind thoughts � it was most appreciated. Beginning June 2 and extending through the weekend, the National Association of Trade Exchanges will be holding its 27th annual convention. Hosted by the Arizona Trade Exchange, the event will be staged at the Phoenix Marriott Mesa hotel. IMS Barter has released phase one of its enhanced website. The initial redesign will allow for easier subsequent improvements to the website for both public visitors as well as IMS members. On another front, CEO Don Mardak announced that the company will make up to 4% in stock repurchases due to its undervalued price. Americans spent $102.5 billion on legal services in 2009, according to the latest available data from the U.S. Department of Commerce. Attorney services are not inexpensive, which is a good reason to consult with your trade exchange broker to see what attorneys are available on trade. According to Massage magazine, 80% of massage therapists barter their services ... that�s up from 72% in 2009. They will barter their services approximately 12 times a year for an average value totaling $558, according to figures compiled by the American Massage Therapy Association. In recognition of his extraordinary efforts on behalf of IRTA, the International Reciprocal Trade Association�s Global Board of Directors unanimously voted to designate David Wallach as President Emeritus of IRTA. This prestigious lifetime honor is only given to those select individuals who have earned the title based on their exemplary service to IRTA, and whose advice and counsel is still needed within the organization. Wallach is the first person in the history of IRTA to be given the President Emeritus title. Dr. Gary Goodman, author of a book about 77 best practices in negotiation, is a big proponent of barter. (His dad was a radio/TV executive and involved in many barter deals.) Goodman reasons that in any economy barter is smart. However it�s use is especially smart in a tight market, when making trades is a great way to reduce cash prices without reducing one�s overall compensation. A neighborhood program in the Seattle area of Ballard was started by local resident Anna Easer Kihara. She calls her new idea Bountiful Backyard Barter as her program enables participants to trade bushels of homegrown organic produce for other produce including eggs, cheese, canned goods, beer, or skills such as garden design or help harvesting. It�s called Bono Barter Clinic, and it�s available on Thursday�s inside Dr. John House Medical Clinic located in Bono, Arkansas. Dr. House set it up for those in the area who have a tight budget. On Thursday�s he accepts canned produce, manual labor (et cetera) as payment for his medical services. A large commercial cleaning organization�provides nighttime cleanup for factories, warehouses and restaurants�has joined the IMS Barter Network in the San Francisco Bay Area. Orange County�s largest trade exchange, TradeAmericanCard, will be moving to a new location the first week in March 2011. CEO Mike Ames is elated about the new location which is close to John Wayne Airport and near several major freeways. New phone and fax were not available at the time of publication. Keith Olbermann, who left MSNBC last month, will be hosting a new prime-time news and commentary show on public-affairs channel Current TV. Olbermann will assume the role of chief-news-officer of Current TV, taking an equity stake in the company which former Vice President Al Gore founded in 2005 with Joel Hyatt. Former basketball great Earvin �Magic� Johnson and Ron Burke�s Yucaipa Companies are investing in Vibe Holdings LLC, the parent company of Vibe magazine and the TV show �Soul Train.� The transaction will install Johnson as chairman of the media company. Johnson says the company will continue to look for opportunities to invest in African-American media. Given the economic downturn of he last few years, it is quite surprising to learn that across the nation last year 28% of all the homes purchased were on an all-cash basis � no financing at all was used. This figure was supplied by the National Association of Realtors. When the trade group began tracking the measure in October 2008, the rate was 14%. A reality show, �The Bachelor� was shot at Leandro Rizzuto�s CuisinArt Resort & Spa on the Caribbean island of Anguilla, thanks to a barter deal between the ABC reality show producers and the general manager of the 90-room resort. Free accommodations for the week were provided for the bachelor and the six remaining lady suitors, as well as the film crew. International Monetary Systems (OTCBB:ITNM) has opened another office in Connecticut � IMS Southern Connecticut. The new office is located at 999 Foxon Rd. #30, North Branford, CT.
For more information contact Jay Greene (203) 871-3813, Ext. 2. In 2010 worldwide air travel jumped 8.2% and air freight did even better, up 21%, according to the International Air Transport Association. After the biggest demand decline in the history of aviation in 2009, the world is flying again. ICON International, a corporate barter company located in Stamford (CT), was selected as one of the top 25 �Best Places To Work� in Connecticut for 2011. ICON is a subsidiary of the Omnicom Group. Noted futurist Hazel Henderson says a nation�s Gross Domestic Product measurement provides an incomplete and inadequate measurement of national progress. She says GDP undervalues the real wealth, for example, of Greece, Ireland, Portugal, and Spain by ignoring their well-educated workforces, efficient infrastructures and productive ecosystems � all missing in GDP measurements. For more information: www.HazelHenderson.com and www.EthicalMarkets.com. Here�s a rather startling number � the number of people in the U.S. relying on food stamps, according to the U.S. Department of Agriculture, is now 43.6 million. The National Association of Trade Exchanges (NATE) is planning to hold it�s coming national convention this June in Phoenix. Further details will be forthcoming. Eric Schmidt�s decade of service to Google was acknowledged as he shifts from the company�s CEO to chairman, where he will work on external matters such as partnerships and government relationships. For his efforts Google awarded Schmidt a $100 million equity award that includes stock and stock options. Schmidt currently owns 9.2 million Google shares valued at nearly $5.8 billion. Metro Networks founder David Saperstein has cut the price of his 125 acre equestrian estate by 34% down to $49.5 million. The estate is in Simi Valley, about 40 miles Northwest of Los Angeles. For more on Saperstein�s business success click here. The Philadelphia Eagles� Pro Bowl quarterback, Michael Vick, appeared in a TV commercial for a Philadelphia car dealership last month. His compensation was having the use of a Nissan sport utility vehicle. Lee Anne Busman, founder of Barter Consultants International back in 1999, says 40% of her trade exchange�s business revolves around the four cornerstones of the barter business � media, restaurants, printing and travel. The Atlanta-based company reportedly does $1 million a month in the barter business. St. Paul-based Hubbard Broadcasting Inc. is spending $505 million in cash to acquire 17 Bonneville International Corp. radio stations located in Washington (DC), Chicago, St. Louis and Cincinnati. Hubbard presently operates four radio stations, as well as twelve TV stations in Minnesota, New York and New Mexico. Sony Pictures worked with Home Shopping Network to promote its chick-flick, Eat, Pray, Love, starring Julie Roberts. HSN staged a 3-day shopping event showcasing more than 400 licensed products to its mostly 5 million active female customers in exchange for promoting the movie. Conde Nast Restaurants, a new division of the magazine empire based in Hong Kong, will be capitalizing on their brand names � beyond print � in Asia, the Middle East and Latin America. In Moscow the company has the Vogue Caf�, GQ Bar and Tatler Club. The co-owner of one of Vancouver�s (Canada) internationally acclaimed restaurants wants to create a special network with a social conscience. Meeru Dhalwala�s idea is a city-run web site that connects people and enables them to barter services and favors. People using the site would be clustered together by their postal codes. More than three quarters of U.S. businesses have no employees, generating only 3.2% of sales nationwide, according to the Census Bureau. Firms without employees average $45,000 in sales. The average business posts sales of $1.1 million a year and has about four employees. �William Jennings Bryan, American politician. �Grace Hansen, American dance director. �Mark Twain, American author and humorist. Small business columnist Harvey Mackay stresses that a person needs a specific and clear direction, and understanding of what is wanted, before achievement is attainable. In other words, know what you really want � be very specific. What is your motivation for this accomplishment? Focus on one or two areas, and be willing to take risks. Make 2011 different by setting reasonable, measurable goals, then take charge and move forward with determination. Small businesses will get even more specialized as customers will increasingly seek customized products and services. Startups will be lesws arduous and cheaper, as lower equipment costs and better technology will make it easier than ever to launch a business without a big investment. And they see big and small firms joining forces as collaborative partnerships increase. Small companies will bring innovative practices, market agility and intimate customer knowledge � the big firms will contribute marketing and distribution power. Seattle-based BizXchange (see link at top of page, Platinum Sponsor) reports that trade dollar donations from BizXchange members to non-profit BizXchange members increased to $40,000 this year, up from $9,000 in 2009. One of the nation�s leading �green� non-profit organizations, Green America, has 160,000 members. Their goal is to build a green and just economy. And recently the organization has created The Green Business Network, a B2B trade exchange. Turkey is going to be receiving oil from two African countries through a barter type of payment. Turkey will be providing (investing in) tourism, energy, health and other needed infrastructures. The aggregate value of the barter transaction is $1 billion. The study notes that the Small Business Administration offers real estate loans with considerably better terms than bank loans. Atlanta-based Cumulus Media (NASDAQ:CMLS) tried to buy Citadel Broadcasting Corp. in a $2.1 billion deal, but was rejected by Citadel�s shareholders. Cumulus is the second-largest radio broadcaster in the United States based on station count, with 343 radio stations in 68 U.S. media markets. Las Vegas-based Citadel is the third-largest radio group in the U.S. with 166 FM stations and 59 AM stations in 50 markets. Bank of America will hire 1,000 bankers nationwide in 2011 to focus on businesses with revenue of $250,000 to $3 million a year. The bankers will be based in local branches to focus on building relationships with community businesses.